The other side of Goa hosts a number of natural Buddhist Caves dating back to 250 BC. The name, Lamgao in Goa finds its Buddhist origins meaning abode of the Lamas the monks of Tibet. Two manmade rock-cut caves in Lamgao near Bicholim have an imposing pavilion like structure in the sanctum, massive platform and a chiseled entablature with beams; large pillars and ceiling impart dignity to manmade caves. Due to this elaborate structure only, these caves have massive appearance similar to Buddhist counterpart caves in Deccan region. 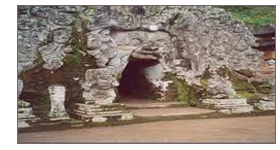 Rivona Caves also constitute the footprints of Buddhist heritage in Goa. Believed to be carved in by the Buddhist monks in 6th-7th century, the cave has a lot of religious and historical significance. The fact that the caves were built by Buddhist monks indicate the presence of Buddhist culture and community in Goa during that period.